Forty years on from its release, Meat Loaf's most famous album gets the blazing operatic treatment it undoubtedly deserves. Resembling a feverish hybrid of We Will Rock You and Peter Pan, this unapologetically thunderous musical is a mighty showcase for the songwriting talents of Jim Steinman. Sometimes it's as if Bruce Springsteen is performing Wagner, sometimes it's as if a posse of unemployed Wagnerians are attempting a hyperextended version of Born to Run, and sometimes it's frankly much stranger than that. The plot is likely to mystify anyone who's not an ardent devotee of both Meat Loaf and J M Barrie — a smallish constituency, I'd guess. 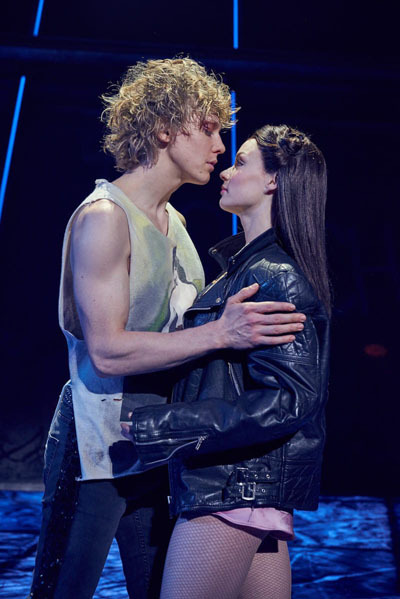 At its heart is Andrew Polec's rough and charismatic Strat, the leader of a group of rebellious teenagers called The Lost. They lurk in an underground retreat, hiding from sinister overlord Falco. Strat is infatuated with Falco's daughter Raven (Christina Bennington), and when he eventually makes a major play for her we're deep into Romeo and Juliet territory, albeit with the emotional volume dialled up well past eleven. The script may be thin, but the songs are never less than bombastic. Director Jay Scheib favours two styles of performance — loud, and louder. His cast are equal to this, and besides the superb Polec there's glorious work from Danielle Steers and Sharon Sexton. Equally impressive is Jon Bausor's design, which is like an expensive tasting menu — a mix of swanky grandiosity, deranged fantasy and whimsical surprises — though the less said about the ungainly choreography the better. Crucially, the big numbers all take wing. It's hard to imagine that many of English National Opera's regular clientele will appreciate this three-hour show's lurid silliness or its potential to turn into a singalong. A riot of leather, gym-toned torsos, dubious hairstyles and dodgy puns, it's light years away from Monteverdi. But this jaw-dropping spectacle — at some pretty jaw-dropping prices — will certainly bring a fresh audience to the Coliseum.